Almyrida is a picturesque fishing village located in Apokoronas, at Chania prefecture, on entering Souda Bay overlooking the White Mountains, between Chania and Rethymno. Located at a distance of 25 km from Chania, Almyrida is accessible from the highway from Chania to Rethymno, from where it is only a 5 km distance. Almyrida, situated in the area of Apokoronas, is a popular seaside resort that is small and yet very popular for its amazing beach stretching along the coast for about 2 km. Kalives and Almyrida are two resorts that are quite recent due to the great European interest in buying land here. 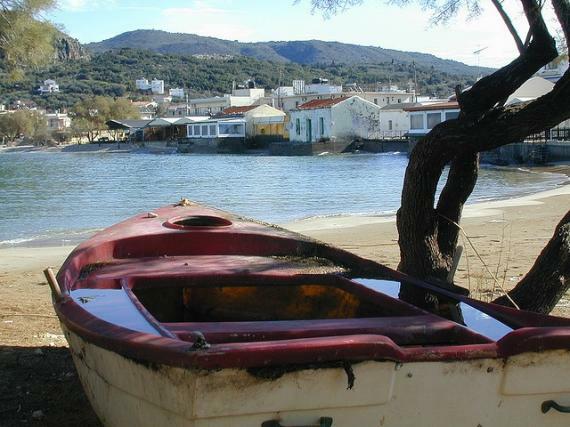 You will see for your own that the coastal road along the resort of Almyrida has something to offer to everyone. From little shops selling everything you can think of -from handmade soaps to souvenirs, jewelries and all sort of goodies- this is a top choice if you what you are after is tranquility and relaxation. If you wish to spend quality time with your other half or your family away from all these winter worries then press the “book now” button! Away from all the hassle and bustle of the busy city, here you will get in touch with your more... natural self in one of the numerous perfectly organised beaches that will make sure that you get everything you ask for. Almyrida’s sandy beach with crystal clear waters, sun beds also offers you the chance to practice your favorite water sports. On the other hand even if you do wish to party all night long you may book your holiday in Almyrida and choose Chania for your nights out that is really close and has everything from restaurants and traditional taverns to night clubs and bars of all types. With two glowing sandy beaches Almyrida has crystal clear and quite shallow waters that will be the perfect choice for you and your loved ones. Try yourself at the extreme sports like wind surfing and explore the new you in the picturesque seaside village of Almyrida! Find information about selected Hotels, apartments and rooms in Almyrida to choose the perfect place for your accommodation.